THOMAS JEFFERSON, author of the Declaration of Independence, was born on April 13, 1743 and grew up on the family plantation at Shadwell in Albermarle County, Virginia. His father was Peter Jefferson, who, with the aid of thirty slaves, tilled a tobacco and wheat farm of 1,900 acres and like his fathers before him, was a justice of the peace, a vestryman of his parish and a member of the colonial legislature. The first of the Virginia Jefferson’s of Welsh extraction, Peter in 1738 married Jane Randolph. Of their ten children, Thomas was the third. Thomas inherited a full measure of his father’s bodily strength and stature, both having been esteemed in their prime as the strongest men of their county. He also inherited his father’s inclination to liberal politics, his taste for literature and his aptitude for mathematics. The Jefferson’s were a musical family; the girls sang the songs of the time, and Thomas, practicing the violin assiduously from boyhood, became an excellent performer. In 1757, when Thomas was only fourteen, his father died, leaving him heir to an enormous estate. On his deathbed, his father left an order that his son’s education, already well advanced in a preparatory school, should be completed at the College of William and Mary, a circumstance which Thomas always remembered with gratitude, saying that if he had to choose between the education and the estate his father left him, he would choose the education. At seventeen, when young Jefferson entered the College of William and Mary he was tall, raw-boned, freckled, and sandy haired, with large feet and hands, thick wrists, and prominent cheekbones and chin. His classmates described him as far from handsome, a fresh, healthy looking youth, very erect, agile and strong, with something of rusticity in his air and demeanor. The college at that time had one truly outstanding educator, Dr. William Small of Scotland, professor of mathematics. Jefferson said in his autobiography that his coming under the influence of Dr. Small “probably fixed the destinies of my life”. Dr. Small gave Jefferson the views of the connection of the sciences and of the system of things of which man is a part, which then prevailed in the advanced scientific circles of Europe. 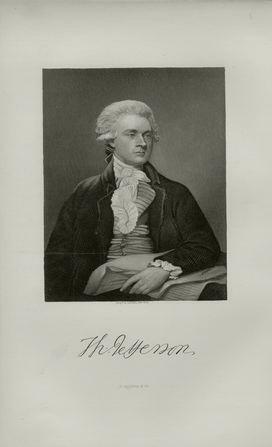 As a student, Jefferson attended the musical parties that the lieutenant governor, Francis Fauquier hosted. Jefferson was always present with his violin and participated in the concert, the governor himself also was a performer. From Fauquier, a man of the world of the period, Jefferson learned much of the social, political, and parliamentary life of the Old World. George Wythe, who was then a young lawyer of Williamsburg, often frequented the governor’s table, and contributed immensely to the forming of Jefferson’s mind. Upon his graduation in 1762, Jefferson took up the study of law, under the guidance of George Wythe. While he was a student, he was an eyewitness of those memorable scenes in the Virginia legislature, which followed the passage of the stamp act. He was present as a spectator in the house when Patrick Henry read his five resolutions, enunciating the principal that Englishmen living in America had all the rights of Englishmen living in England, the chief of which was that they could only be taxed by their own representatives. On coming of age in April 1764, Jefferson assumed the management of his father’s estate and was appointed to two of his father’s offices—justice of the peace and vestryman. He gave much attention to the cultivation of his lands, and remained always an attentive, zealous and improving farmer. Early in 1767, Jefferson was admitted to the bar of Virginia, and entered at once the practice of his profession. Jefferson was an accurate, painstaking and laborious lawyer and his business blossomed. He practiced law for nearly eight years, until the Revolutionary contest summoned him to other labors. His public life began on May 11, 1769, when Jefferson took his seat as a member of the Virginia House of Burgesses, George Washington also being a member. Jefferson was then twenty-six years old. On becoming a public man he made a resolution “never to engage, while in public office, in any kind of enterprise for the improvement of my fortune, nor to wear any other character than that of a farmer.” On the close of his public career of nearly half a century, he could say that he had kept this resolution. On January 1, 1772 Jefferson married Martha Wayles Skelton, who was the daughter of John Wayles, a wealthy Williamsburg lawyer, from whom she inherited a large property. 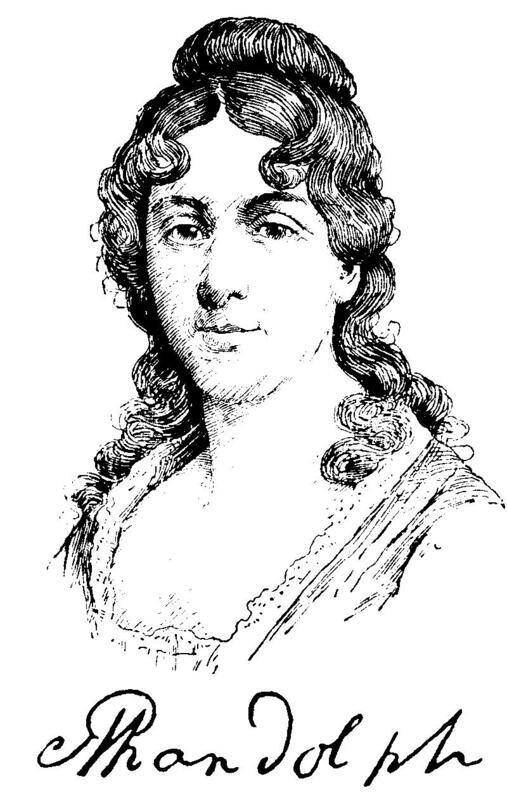 Her first husband, Bathurst Skelton died before she was twenty years of age, and Jefferson was one of her many suitors. A few days after their marriage, he took her to live in his partly constructed mountaintop home, Monticello. The next year, the death of Martha’s father brought them a great increase of fortune – doubling Jefferson’s estate. In March 1775, Jefferson was in Richmond as a member of the convention, which assembled in the church of St. John to consider what course Virginia should take in the crisis. The last act of this convention was to appoint a replacement in the case of a vacancy in the delegation of Virginia to congress. That replacement was Thomas Jefferson and on June 21, 1775, Jefferson took his seat as a substitute for Peyton Randolph, who had been called home. Jefferson was an earnest, diligent, and useful member of the congress. His readiness in composition, his profound knowledge of British law and his innate love of freedom and justice, gave him solid standing in the body. In May 1776, the news reached congress that the Virginia convention had unanimously voted for independence. 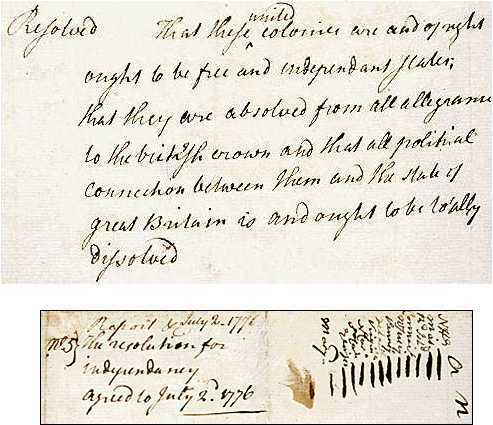 ``Resolved, That these United Colonies are, and of right ought to be, free and independent states, that they are absolved from all allegiance to the British Crown, and that all political connection between them and the state of Great Britain is, and ought to be, totally dissolved.'' . On July 2, 1776 the United Colonies of America officially became the United States of America. It was July 2, 1776 that John Adams thought would be celebrated by future generations of Americans. The Declaration, which explained why the Colonies declared their independence, was adopted by the Continental Congress July 4, 1776. The Committee of five was Thomas Jefferson, assisted by John Adams, Benjamin Franklin, Robert R. Livingston, and Roger Sherman. 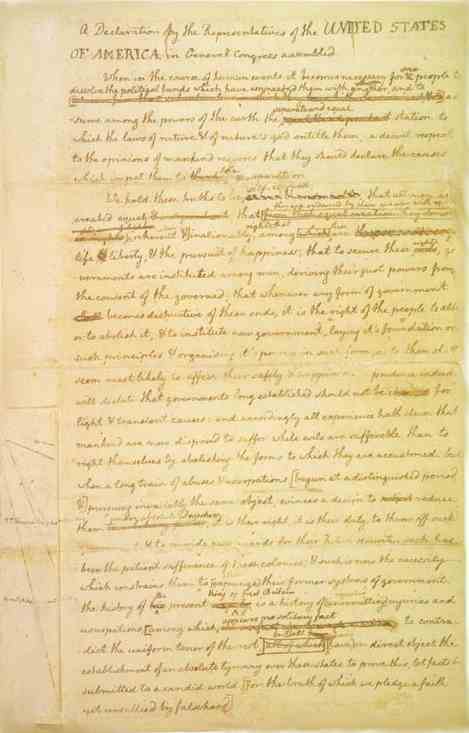 The committee assigned Thomas Jefferson the task of producing a draft Declaration for its consideration. Jefferson drew heavily on George Mason's Virginia Declaration of Rights (passed on June 12, 1776), state and local calls for independence, and his own work on the Virginia Constitution. 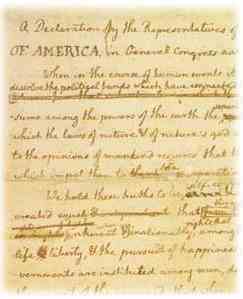 There were many revisions made by Jefferson, the committee of five, and then by Congress itself before the final vote on July 4, 1776. One edit Jefferson didn't want was the removal of a long paragraph that ascribed liability of the slave trade to British King George III. Despite this and other key edits and changes Jefferson is rightfully considered the author of the Declaration of Independence. The document was debated in congress on July 2, 3 and 4. Thursday, the 4th was a warm day, and the members in the afternoon became weary and impatient with the long strain upon their nerves. Jefferson used to relate with much merriment that the final vote upon the Declaration was hastened by swarms of flies, which came from a neighboring stable, and added to the discomfort of the members. 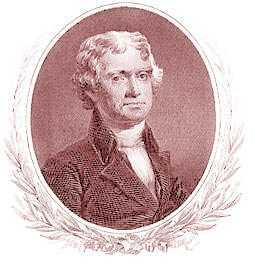 A few days afterward, Jefferson was one of a committee to devise a seal for the newborn country. Among their suggestions (and this was the only one accepted by congress) was the best legend ever appropriated, E pluribus unum, a phrase that had served as a motto on the cover of the “Gentleman’s Magazine” for many years. In the fall of 1776, Jefferson resigned his seat in congress on the grounds that the health of his wife and the condition of his household made his presence in Virginia indispensable. He had again been elected a member of the Virginia legislature, and his heart was set upon the work of purging the statute books of unsuitable laws, and bringing the laws of Virginia up to the level of the Declaration. For the next three years, Jefferson procured the abolition of entails, led the fight for the disestablishment of the Church, and as a member of the Committee on Revisors, recommended far reaching reforms in the legal code of the state. In January 1779, the Virginia legislature elected Jefferson governor of the state, to succeed Patrick Henry, whose third term ended on June 1. His governorship of two years, during a time of British invasion, ended unhappily, largely through fault of circumstances. He declined re-election to a third term, and induced his friends to support General Thomas Nelson, commander-in-chief of the militia, who was elected. On September 6, 1782, Jefferson’s wife died. Jefferson had retained a romantic devotion to her throughout his life, and because of her failing health refused foreign appointments in 1776 and again in 1781, having promised that he would accept no public office that would involve their separation. For four months prior to her death, he was never out of calling, and he was insensible for several hours after her death. On her death, Martha left three daughters, the youngest four months old. Returning to public life to assuage his grief, Jefferson succeeded Benjamin Franklin as minister to France in 1785. His sympathy for the French Revolution led him into conflict with Alexander Hamilton when Jefferson was Secretary of State in President Washington's Cabinet. He retired from that office after three years. As a reluctant candidate for President in 1796, Jefferson came within three votes of election. Through a flaw in the Constitution, he became Vice President, although an opponent of just elected President Adams. In 1800 Jefferson ran for president, won and served two distinguished terms. Jefferson’s career during his presidency is so integral a part of the history of the country, that it cannot be described here. The freedom of the individual human being was ever his main concern, and it was his faith in men that made him a prophet of progress. In his old age, he fathered the University of Virginia, and he valued public enlightenment next after private freedom. Jefferson retained his health nearly to his last days, and had the happiness of living to the fiftieth anniversary of the Declaration of Independence. He died at twenty minutes to one p.m. on July 4, 1826. 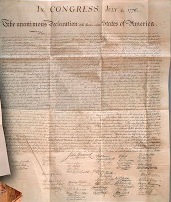 Letter signed "Th: Jefferson," as Secretary of State, to New York Governor George Clinton, relating to copies of the first census of the United States, an act to establish a uniform rule of naturalization and an act making appropriations for the support of Government for the year 1790 – three pivotal laws at the very foundation of our government. A powerful historical letter transmitting new Federal Laws which the Great State of New York must now abide by. George Washington had been elected president only a year, and the first act of the congress of the U.S. was passed on June 1, 1789, setting oaths of office for Federal officials on March 31, 1790. 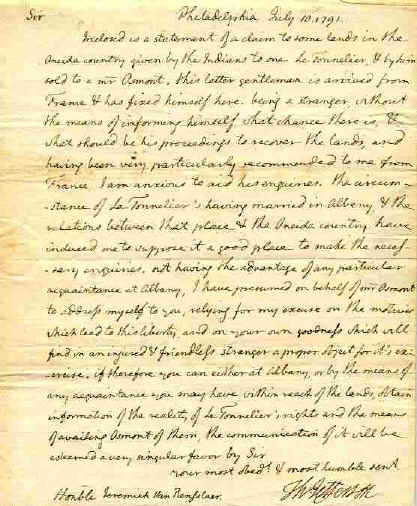 Autograph letter signed ("Th: Jefferson") to Jeremiah Van Rensselaer, Philadelphia, and 10 July 1791. I page 4to, integral address leaf with Jefferson's free frank: "Th: Jefferson' and small "Free" stamp. The Secretary of State aids "an injured and friendless" Frenchman with a land claim. "a claim to some lands in the Oneida country given by the Indians to one Le Tonnelier. & by him sold to a Mr. Osruont. This latter gentleman is arrived from France & has fixed himself what chance there is, & what should be his proceedings to recover the lands, and having been very particularly recommended to me from France, I am anxious to aid hisenquiries. The circumstance of Le Tonnelier's having married in Albany & the relations between that place & the Oneida country have induced me to suppose it a good place to make the necessary enquiries. Not having the advantage of any particular acquaintance at Albany; I have presumed on behalf of Mr. Osmont to address myself to you, relying for my excuse on the motives which lead to this liberty; and on your own goodness which will find in aninjured & friendless stranger a proper object for its exercise. If therefore you can either at Albany or by the means of any acquaintance on may have within reach of the (ands. obtain information of the realm of Le Tonnelier's rights and the means of availing Osmont of them, the communication of it will be esteemed a very singular favor"
JEFFERSON, Thomas, third president of the United States, born in Shadwell, Albemarle County, Virginia, 2 April, 1743; died at Monticello, in the same county, 4 July, 1826. His father was Peter Jefferson, who, with the aid of thirty slaves, tilled a tobacco and wheat farm of 1,900 acres; a man physically strong, a good mathematician, skilled in surveying, fond of standard literature, and in politics a British Whig. Like his fathers before him, Peter Jefferson was a justice of the peace, a vestryman of his parish, and a member of the colonial legislature. The first of the Virginia Jeffersons, who were of Welsh extraction, was a member of the Virginia legislature of 1619, noted as the first legislative body ever convened on the western continent. Peter married in 1738 Jane, daughter of Isham Randolph, a wealthy and conspicuous member of the family of that name. Of their ten children, Thomas was the third, born in a plain, spacious farm-house, traces of which still exist. He inherited a full measure of his father's bodily strength and stature, both having been esteemed in their prime the strongest men of their county. He inherited also his father's inclination to liberal polities, his taste for literature, and his aptitude for mathematics. Peter Jefferson died in 1757, when his son Thomas was fourteen years of age. On his death-bed he left an injunction that the education of his son, already well advanced in a preparatory school, should be completed at the College of William and Mary, a circumstance which his son always remembered with gratitude, saying that if he had to choose between the education and the estate his father left him, he would choose the education. His schoolmates reported that at school he was noted for good scholarship, industry, and shyness. Without leaving his father's land he could shoot turkeys, deer, foxes, and other game. 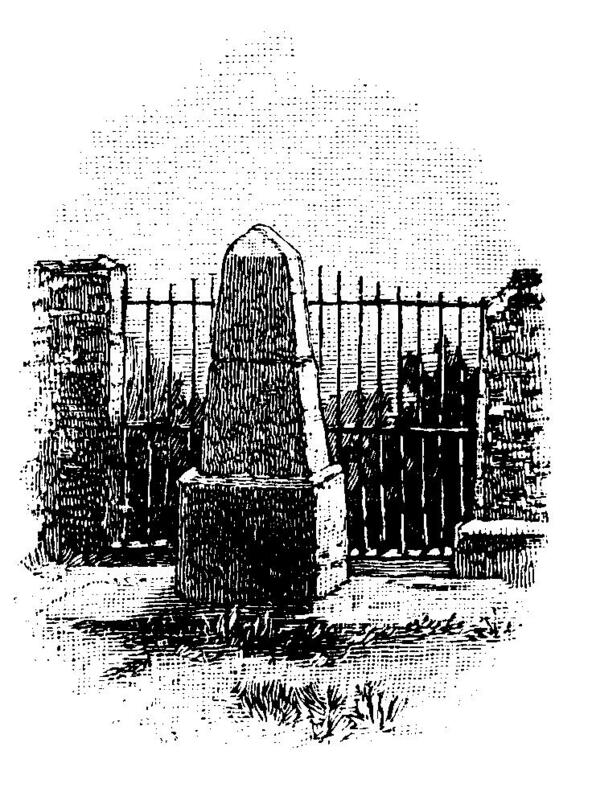 His father in his last hours had specially charged his mother not to permit him to neglect the exercise requisite for health and strength; but the admonition was scarcely necessary, for the youth was a keen hunter and had been taught by his father to swim his horse over the Rivanna, a tributary of the James, which flowed by the estate. The Jeffersons were a musical family; the girls sang the songs of the time, and Thomas, practicing the violin assiduously from boyhood, became an excellent performer. At seventeen, when he entered the College of William and Mary, he was tall, raw-boned, freckled, and sandy-haired, with large feet and hands, thick wrists, and prominent cheek-bones and chin. His comrades described him as far from handsome, a fresh, healthy-looking youth, very erect, agile, and strong, with something of rusticity in his air and demeanor. The college was not then efficient nor well equipped, but there was one true educator connected with it, Dr. William Small, of Scotland, professor of mathematics. 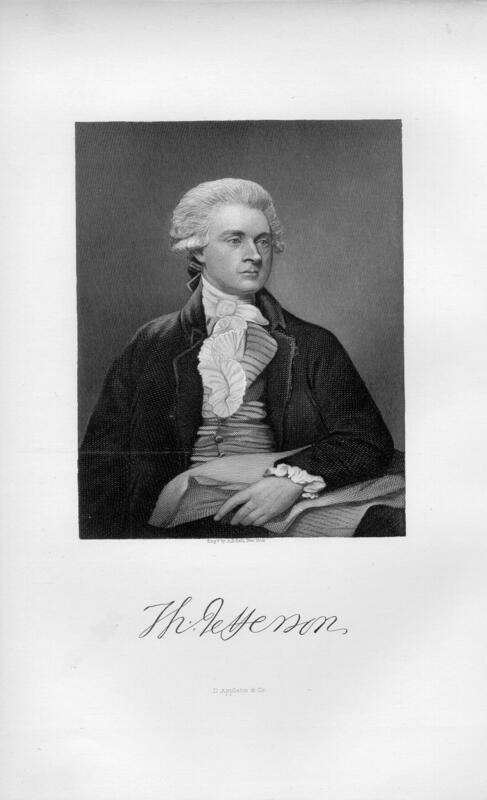 Jefferson gratefully remembered him as an ardent student of science, who possessed a happy talent for communicating knowledge, a man of agreeable manners and enlightened mind. He goes so far as to say in his autobiography that his coming under the influence of Dr. Small "probably fixed the destinies of my life." The learned and genial professor became attached to his receptive pupil, made him the daily companion of his walks, and gave him those views of the connection of the sciences and of the system of things of which man is a part which then prevailed in the advanced scientific circles of Europe. Professor Small was a friend of the poet Erasmus Darwin, progenitor of an illustrious line of learned men. Jefferson was a hard student in college, and at times forgot his father's dying injunction as to exercise. He kept horses at Williamsburg, but as his love of knowledge increased his rides became shorter and less frequent, and even his beloved violin was neglected. There was a time, as he remembered, when he studied fifteen hours a day. Once a week the lieutenant-governor, Francis Fauquier, had a musical party at the "palace," to which the guests, in the good old style of that century, brought their instruments. Jefferson was always present at these parties with his violin, and participated in the concert, the governor himself being also a performer. From Fauquier, a man of the world of the period, he learned much of the social, political, and parliamentary life of the Old World. George Wythe, afterward chancellor, was then a young lawyer of Williamsburg. He was one of the highly gifted men that frequented the governor's table, and contributed essentially to the forming of Jefferson's mind. On his graduation, Jefferson entered upon the study of law, under the guidance of George Wythe. As his father's estate was charged with the maintenance of a large family, a profession was necessary to the student, and he entered upon his preparation for the bar with all his energy and resolution. On coming of age, in April, 1764, he assumed the management of the estate, and was appointed to two of his father's offices--justice of the peace and vestryman. He gave much attention to the cultivation of his lands, and remained always an attentive, zealous, and improving farmer. He attached importance all his life to the fact that his legal training was based upon the works of Lord Coke, of whom he said that "a sounder Whig never wrote, nor one of profounder learning in the orthodox doctrines of the British constitution, or in what were called British liberties." It was his settled conviction that the early drill of the colonial lawyers in "Coke upon Lyttleton" prepared them for the part they took in resisting the unconstitutional acts of the British government. Lawyers formed by Coke, he would say, were all good Whigs; but from the time that Blackstone became the leading text book "the profession began to slide into Toryism." His own study of Coke led him to extend his researches into the origins of British law, and led him also to the rejection of the maxim of Sir Matthew Hale, that Christianity is parcel of the laws of England. His youthful treatise on this complex and difficult point shows us at once the minuteness and the extent of his legal studies. While he was a student of law, he was an eye-witness of those memorable scenes in the Virginia legislature which followed the passage of the stamp-act, he was present as a spectator in the house when Patrick Henry read his five resolutions, written upon a blank leaf torn from a "Coke upon Lyttleton," enunciating the principle that Englishmen living in America had all the rights of Englishmen living in England, the chief of which was, that they could only be taxed by their own representatives. When he was an old man, seated at his table at Monticello, he loved to speak of that great day, and to describe the thrill and ecstasy of the moment when the wonderful orator, interrupted by cries of "Treason," uttered the well-known words of defiance: "If this be treason, make the most of it!" Early in 1767, about his twenty-fourth birthday, Jefferson was admitted to the bar of Virginia, and entered at once upon the practice of his profession. Connected through his father with the yeomen of the western counties, and through his mother with the wealthier planters of the eastern, he had not long to wait for business. His first account-book, which still exists, shows that in the first year of his practice he was employed in sixty-eight cases before the general court of the province, besides county and office business. He was an accurate, painstaking, and laborious practitioner, and his business increased until he was employed in nearly five hundred cases in a single year, which yielded an average profit of about one pound sterling each. He was not a fluent nor a forcible speaker, and his voice soon became husky as he proceeded; but James Madison, who heard him try a cause, reports that he acquitted himself well, and spoke fluently enough for his purpose. He loved the erudition of the law, and attached great importance to the laws of a country as the best source of its history. It was he who suggested and promoted the collection of Virginia laws known as "Henning's Statutes at Large," to which he contributed the most rare and valuable part of the contents. He practiced law for nearly eight years, until the Revolutionary contest summoned him to other labors. His public life began 11 May, 1769, when he took his seat as a member of the Virginia house of burgesses, Washington being also a member. Jefferson was then twenty-six years old. On becoming a public man he made a resolution "never to engage, while in public office, in any kind of enterprise for the improvement of my fortune, nor to wear any other character than that of a farmer." At the close of his public career of nearly half a century he could say that he had kept this resolution, and he often found the benefit of it in being able to consider public questions free from the bias of self-interest. This session of the burgesses was short. On the third day were introduced the famous four resolutions, to the effect that the colonies could not be lawfully taxed by a body in which they were not represented, and that they might concur, co-operate, and practically unite in seeking a redress of grievances. On the fifth day of the session the royal governor, Lord Botetourt, dissolved the house; but the members speedily reassembled in the great room of the Raleigh tavern, where similar resolutions, with others more pointed, were passed. The decency and firmness of these proceedings had their effect. Before many months had passed the governor summoned the assembly and greeted them with the news that parliament had abandoned the system of taxing the colonies--a delusive statement, which he, however, fully believed himself authorized to make. Amid the joy--too brief--of this supposed change of policy, Jefferson made his first important speech in the house, in which he advocated the repeal of the law that obliged a master who wished to free his slaves to send them out of the colony. The motion was promptly rejected, and the mover, Mr. Bland, was denounced as an enemy to his country. On 1 January, 1772, Jefferson married Mrs. Martha Wayles Skelton, a beautiful and childless young widow, daughter of John Wayles, a lawyer in large practice at the Williamsburg bar. His new house at Monticello, a view of which is, given on page 419, was then just habit, able, and he took his wife home to it a few days after the ceremony. Next year the death of his wife's father brought them a great increase of fortune--40,000 acres of land and 135 slaves, which, when the encumbrances were discharged, doubled Jefferson's estate. He was now a fortunate man indeed: opulent in his circumstances, happily married, and soon a father. We see him busied in the most pleasing kinds of agriculture, laying out gardens, introducing new products, arranging his farms, completing and furnishing his house, and making every effort to convert his little mountain, covered with primeval forest, into an agreeable and accessible park. After many experiments he domesticated almost every tree and shrub, native and foreign, that could survive the Virginia winter. The contest with the king was soon renewed, and the decisive year, 1774, opened. It found Thomas Jefferson a thriving and busy young lawyer and farmer, not known beyond Virginia; but when it, closed he was a person of note among the patriots of America, and was proscribed in England. It was he who prepared the "Draught of Instructions" for Virginia's Declaration to the Congress which met at Philadelphia in September. That congress, he thought, should unite in a solemn address to the king; but they should speak to him in a frank and manly way, informing him, as the chief magistrate of an empire governed by many legislatures, that one of those legislatures--namely, the British parliament--had encroached upon the rights of thirteen others. They were also to say to the king that he was no more than the chief officer of the people, appointed by the laws and circumscribed with definite powers. He also spoke, in this very radical draught, of "the late deposition of his Majesty, King Charles, by the Commonwealth of England" as a thing obviously right. He maintained that the parliament of Virginia had as much right to pass laws for the government of the people of England as the British legislature had to pass laws for the government of the people of Virginia. "Can any one reason be assigned," he asked, "why a hundred and sixty thousand electors in the island of Great Britain should give law to four millions in the states of America?" The draught, indeed, was so radical on every point that it seemed to the ruling British mind of that day mere insolent burlesque. It was written, however, by Jefferson in the most modest and earnest spirit, showing that, at the age of thirty-one, his radical opinions were fully formed, an elicit expression was wholly unqualified by a knowledge of the world beyond the sea. This draught, though not accepted by the convention, was published in a pamphlet, copies of which were sent to England, where Edmund Burke caused it to be republished with emendations and additions of his own. It procured for the author, to use his own language, "the honor of having his name inserted in a long list of proscriptions enrolled in a bill of attainder." The whole truth of the controversy was given in this pamphlet, without any politic reserves. In March, 1775, Jefferson, who had been kept at Monticello for some time by illness, was in Richmond as a member of the convention which assembled in the parish church of St. John to consider what course Virginia should take in the crisis. It was as a member of this body that Patrick Henry, to an audience of 150 persons, spoke the prophetic words in solemn tones as the key to the enigma: "We must fight! The next gale that sweeps from the north will bring to our ears the clash of resounding arms." These sentences, spoken twenty-seven days before the affair of Lexington, convinced the convention, and it was agreed that Virginia should arm. A committee of thirteen was appointed to arrange a plan, among the members of which were Patrick Henry, George Washington, Richard Henry Lee, Benjamin Harrison, the speaker, Edmund Pendleton, and Thomas Jefferson. The plan they agreed upon was this: The populous counties to raise and drill infantry companies; the other counties horsemen, and both to wear the hunting-shirt, which Colonel Washington told them was the best field-uniform he knew of. The last act of this convention was to appoint that, in case a vacancy should occur in the delegation of Virginia to congress, Thomas Jefferson should supply the place. A vacancy occurred, and on 20 June, 177;5, the day on which Washington received his commission as commander-in-chief, Jefferson reached Philadelphia, and took his seat the next morning in congress. Before the sun set that day congress received news of the stirring battle of Bunker Hill. Jefferson was an earnest, diligent, and useful member of the congress. John Adams, his fellow-member, describes him as "so prompt, frank, explicit, and decisive upon committees and in conversation that he soon seized upon my heart." His readiness in composition, his profound knowledge of British law, and his innate love of freedom and justice, gave him solid standing in the body. On his return to Virginia he was re-elected by a majority that placed him third in the list; of seven members. After ten days' vacation at home, where he then had a house undergoing enlargement, and a household of thirty-four whites and eighty-three blacks, with farms in three counties to superintend, he returned to congress to take his part in the events that led to the complete and formal separation of the colonies from the mother-country. In May, 1776, the news reached congress that the Virginia convention were unanimous for independence, and on 7 June Richard Henry Lee obeyed the instructions of the Virginia legislature by moving that independence should be declared. On 10 June a committee of five was appointed to prepare a draught of the Declaration -- Thomas Jefferson, John Adams, Benjamin Franklin, Robert R. Livingston, and Roger Sherman. Mr. Jefferson, being the chairman of the committee, was naturally asked to write the document, he then lived near what is now the corner of Market and Seventh streets. The paper was written in a room of the second floor, upon a little writing-desk three inches high, of his own contriving, which still exists. Congress subjected his draught to a severe and prolonged revision, making many suppressions, additions, and alterations, most of which were improvements. One passage was suppressed in which he gave expression to the wounded feelings of the American people in being so unworthily treated by brethren and fellow-citizens the document was debated in congress on 2, 3, and 4 July. Thursday, the 4th, was a warm day, and the members in the afternoon became weary and impatient with the long strain upon their nerves. Jefferson used to relate with much merriment that the final vote upon the Declaration was hastened by swarms of flies, which came from a neighboring state, and added to the discomfort of the members. A few clays afterward he was one of a committee to devise a seal for the new-born power. Among their suggestions (and this was the only one accepted by congress) was the best legend "ever appropriated, E pluribus unum" , a phrase that had served as a motto on the cover of the "Gentleman's Magazine" for many years. It was originally borrowed from a humorous poem of Virgil's. Having thus linked his name imperishably with the birthday of the nation, Jefferson resigned his seat in congress, on the ground that the health of his wife and the condition of his household made his presence in Virginia indispensable, he had also been again elected a member of the Virginia legislature, and his heart was set upon the work of purging the statute-books of unsuitable laws, and bringing up Virginia to the level of the Declaration. He had formed a high conception of the excellence of the New England governments, and wished to introduce into his native state the local institutions that had enabled those states to act with such efficiency during the war. After some stay at home he entered upon this work at Williamsburg, where, 8 October, 1776, a messenger from congress informed him that he had been elected joint commissioner, with Franklin and Deane, to represent the United States at Paris. After three days of consideration, he resisted the temptation to go abroad, feeling that his obligations to his family and his state made it his duty to remain at home. In reorganizing Virginia, Jefferson and his friends struck first at the system of entail, which, after three weeks' earnest debate, was totally destroyed, so that all property in Virginia was held in fee simple and could be sold for debt. He next attempted, by a short and simple enactment, to abolish the connection between church and state. He was able to accomplish but a small portion of this reform at that session, but the work was begun, and nine years later the law drawn by Jefferson, entitled "An Act for establishing Religious Freedom," completed the severance. This triumph of equal rights over ancient prejudices and restriction Jefferson always regarded as one of his most important contributions to the happiness of his country. Some of his utterances on this subject have passed into familiar proverbs "Government has nothing to do with opinion," "Compulsion makes hypocrites, not converts," "It is error alone which needs the support of government; truth can stand by itself." It was he who drew the bill for establishing courts of law in the state, and for prescribing their powers and methods. It was he also who caused the removal of the capital to Richmond. He carried the bill extirpating the principle of primogeniture. It was the committee of which he was chairman that abolished the cruel penalties of the ancient code, and he made a most earnest attempt to establish a system of public education in the state. During two years he and his colleagues, Hamilton, Wythe, Mason, and Francis Lightfoot Lee, toiled at the reconstruction of Virginia law, during which they accomplished all that was then possible, besides proposing many measures that were passed at a later day. He could write to Dr. Franklin in 1777 theft the people of Virginia had "laid aside the monarchical and taken up the republican government with as much ease as would have attended their throwing off an old and putting on a new suit of clothes. " It was Jefferson and his friends who wrought this salutary change, and they were able to effect it because, during the first three years of the war, Virginia was almost exempt from disturbance. In the spring of 1779, when Burgoyne's army, as prisoners of war, were en-camped near Monticello, Jefferson was assiduous in friendly attentions both to the British and the Hessians, throwing open his house and grounds to them, and arranging many agreeable concerts for their entertainment. A British captain, himself a good violinist, who played duets with Jefferson at this time, told the late General John A. Dix, of New York, that Thomas Jefferson was the best amateur he had ever heard. In January, 1779, the Virginia, legislature elected Jefferson governor of the state, to succeed Patrick Henry, whose third term ended on 1 June. The two years of his governorship proved to be the severest trial of his life. With slender and fast diminishing resources, he had to keep up the Virginia regiments in the army of Washington, and at the same time to send all possible supplies to the support of Gen. Gates in his southern campaign The western Indians were a source of constant solicitude, and they were held in check by that brave and energetic neighbor of Governor Jefferson, George Rogers Clarke. The British and Hessian prisoners also had to be supplied and guarded. In the midst of his first anxieties he began the reorganization that he had long desired of the College of William and Mary. Soon, however, his attention was wholly absorbed by the events of the war. On 16 August, 1780, occurred the disastrous defeat of Gates at Camden, which destroyed in a day all that Jefferson had toiled to accumulate in warlike material during eight agonizing weeks. On the last day of 1780, Arnold's fleet of twenty-seven sail anchored in Chesapeake bay, and Arnold, with nine hundred men, penetrated as far as Richmond; but Jefferson had acted with so much promptitude, and was so ably seconded by the county militia, that the traitor held Richmond but twenty-three hours, and escaped total destruction only through a timely change in the wind, which bore him down the river with extraordinary swiftness. In five days from the first summons twenty-five hundred militia were in pursuit of Arnold, and hundreds more were coming in every hour. For eighty-four hours Governor Jefferson was almost continuously in the saddle; and for many months after Arnold's first repulse, not only the governor, but all that Virginia had left of manhood, resources, and credit, were absorbed in the contest. Four times in the spring of 1781 the legislature of Virginia was obliged to adjourn and fly before the approach or the threat of an enemy. Monticello was captured by a troop of horse, and Jefferson himself narrowly escaped. Cornwallis lived for ten days in the governor's house at Elk Hill, a hundred miles down the James, where he destroyed all the growing crops, burned the barns, carried off the horses, killed the colts, and took away twenty-seven slaves. During the public disasters of that time there was the usual disposition among a portion of the people to cast the blame upon the administration, and Jefferson himself was of the opinion that, in such a desperate crisis, it was best that the civil and the military power should be entrusted to the same hand. He therefore declined a re-election to a third term, and induced his friends to support General Thomas Nelson, commander-in-chief of the militia, who was elected. The capture of Cornwallis in November, 1781, atoned for all the previous suffering and disaster. 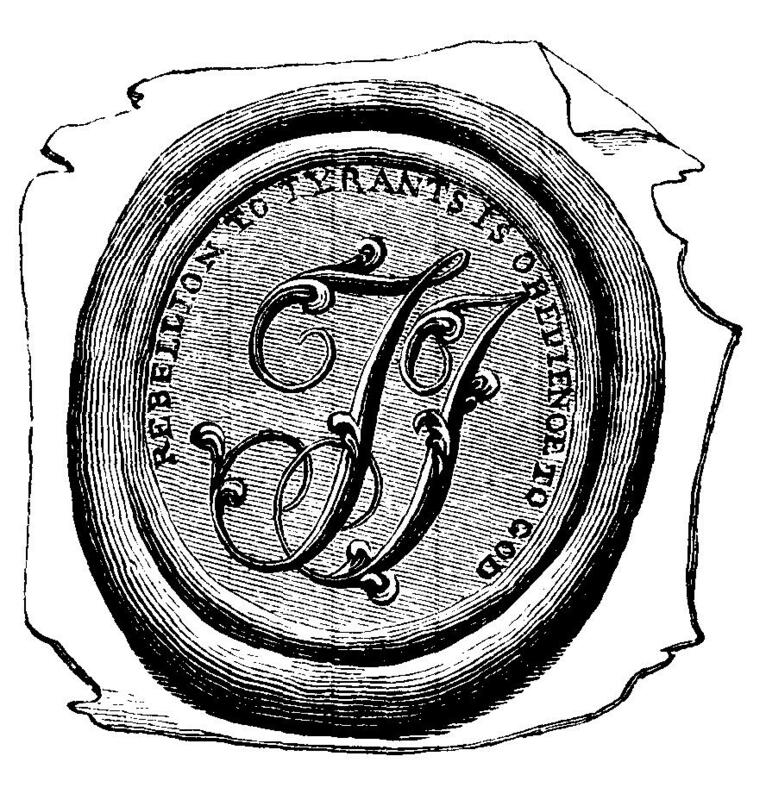 A month later Jefferson rose in his place in the legislature and declared his readiness to answer any charges that might be brought against his administration of the government; but no one responded. After a pause, a member offered a resolution thanking him for his impartial, upright, and attentive discharge of his duty, which was passed without a dissenting voice. On 6 September, 1782, Jefferson's wife died, to his unspeakable and lasting sorrow, leaving three daughters, the youngest four months old. 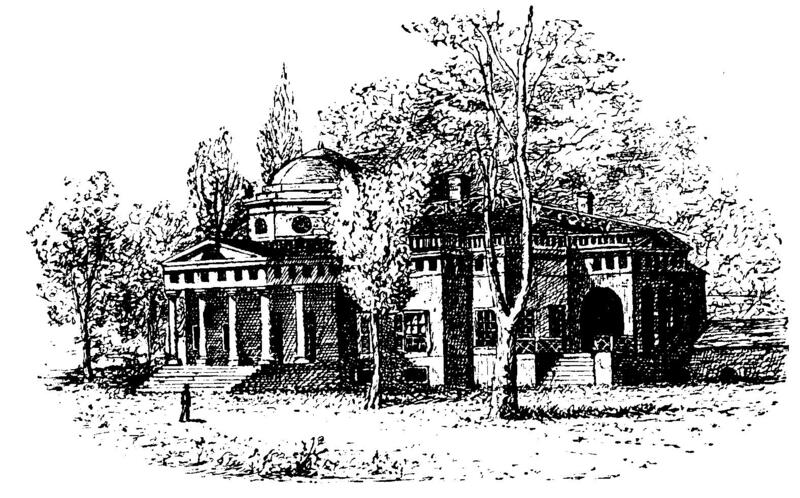 During the stupor caused by this event he was elected by a unanimous vote of congress, and, as Madison reports, "without a single adverse remark," plenipotentiary to France, to treat for peace, he gladly accepted; but, before he sailed, the joyful news came that preliminaries of peace had been agreed to, and he returned to Monticello. In June, 1783, he was elected to congress, and in November took his seat at Annapolis. Here, as chairman of a committee on the currency, he assisted to give us the decimal currency now in use. The happy idea originated with Gouverneur Morris of New York, but with details too cumbrous for common use. Jefferson proposed our present system of dollars and cents, with dimes, half-dimes, and a great gold coin of ten dollars, with subdivisions, such as we have now. Jefferson strongly desired also to apply the decimal system to all measures. When he traveled he carried with him all odometer, which divided the miles into hundredths, which he called cents. "I find," said he, " that every one comprehends a distance readily when stated to him in miles and cents: so he would in feet and cents, pounds and cents." On 7 May, 1784, congress elected Jefferson for a third time plenipotentiary to France, to join Franklin and Adams in negotiating commercial treaties with foreign powers. On 5 July he sailed from Boston upon this mission, and thirty-two days later took up his abode in Paris. On 2 May, 1785, he received from Mr. Jay his commission appointing him sole minister plenipotentiary to the king of France for three years from 10 March, 1785. "You replace Dr. Franklin," said the Count de Vergennes to him, when he announced his appointment. Jefferson replied: " I succeed; no one can replace him." The impression that France made upon Jefferson's mind was painful in the extreme. While enjoying the treasures of art that Paris presented, and particularly its music, fond of the people, too. relishing their amiable manners, their habits and tastes, he was nevertheless appalled at the cruel oppression of the ancient system of government. "The people," said he, "are ground to powder by the vices of the form of government," and he wrote to Madison that government by hereditary rulers was a "government of wolves over sheep, or kites over pigeons." Beaumarchais's "Marriage of Figaro " was in its first run when Jefferson settled in Paris, and the universal topic of conversation was the defects of the established regime. Upon the whole, he enjoyed and assiduously improved his five years' residence in Europe. His official labors were arduous and constant. He strove, though in vain, to procure the release of American captives in Algiers without paying the enormous ransom demanded by the day. With little more success, he endeavored to break into the French protective system, which kept from the kingdom the cheap food that America could supply, and for want of which the people were perishing and the monarchy was in peril. He kept the American colleges advised of the new inventions, discoveries, and books of Europe. He was particularly zealous in sending home seeds, roots, and nuts or trial in American soil. During his journey to Italy he procured a quantity of the choicest rice for the planters of South Carolina, and he supplied Buffon with American skins, skeletons, horns, and similar objects for his collection. In Paris he published his "Notes on Virginia," both in French and English, a work full of information concerning its main subject, and at the same time surcharged with the republican sentiment then so grateful to the people of France. In 1786, when at length the Virginia legislature passed his "Act for Freedom of Religion," he had copies of it printed for distribution, and it was received with rapture by the advanced Liberals. It was his custom while traveling in France to enter the houses of the peasants and converse with them upon their affairs and condition. He would contrive to sit upon the bed in order to ascertain what it was made of, and get a look into the boiling pot, to see what was to be the family dinner. He strongly advised Lafayette to do the same, saying: "You must ferret the people out of their hovels as I have done, look into their kettles, eat their bread, loll on their beds, on pretence of resting yourself, but in fact to find if they are soft." His letters are full of this subject. He returns again and again to the frightful inequalities of condition, the vulgarity and incapacity of the hereditary rulers, and the hopeless destiny of nineteen twentieths of the people. His compassion for the people of France was the more intense from his strong appreciation of their excellent qualities. Having received a leave of absence for six months, he returned with his daughters to Virginia, landing at Norfolk, 18 November, 1789. His reception was most cordial. The legislature appointed a committee of thirteen, with Patrick Henry at their head, to congratulate him on his return, and on the day of his landing he read in a newspaper that President Washington, in settling the new government, had assigned to Thomas Jefferson the office of secretary of state. "I made light of it," he wrote soon afterward, "supposing I had only to say no, and there would be an end of it." On receiving the official notification of his appointment, he told the president that he preferred to retain the office he held. "But," he added, "it is not for an individual to choose his post. You are to marshal us as may be best for the public good." He finally accepted the appointment, and after witnessing at Monticello, 23 February, 1790, the marriage of his eldest daughter, Martha, to Thomas Mann Randolph, he began his journey to New York. During his absence in France, his youngest daughter, Lucy, had died, leaving him Martha and Maria. On Sunday, 21 March, 1790, he reached New York, to enter upon the duties of his new office. He hired a house at No. 57 Maiden lane, the city then containing a population of 35,000. His colleagues in the cabinet were Alexander Hamilton, secretary of the treasury; Henry Knox, secretary of war; and Edmund Randolph, attorney-general. Jefferson's salary was $3,500, and that of the other members of the cabinet $3,000, a compensation that proved painfully inadequate. "Perhaps even this may sometimes err; but its errors are honest, solitary, and short-lived. Let us, then, forever bow down to the general reason of society. We are safe with that, even in its deviations, for it soon returns again to the right way." To other addresses of welcome he replied in a similar tone. He brought to New York a settled conviction that the republican is the only form of government that is not robbery and violence organized. Feeling thus, he was grieved and astonished to find a distrust of republican government prevalent, in society, and to hear a preference for the monarchical form frequently expressed. In the cabinet itself, where Hamilton dominated and Knox echoed his opinions, the republic was accepted rather as a temporary expedient than as a final good. Jefferson and Hamilton, representing diverse and incompatible tendencies, soon found themselves in ill-accord, and their discussions in the cabinet became vehement. They differed in some degree upon almost every measure of the administration, and on several of the most vital their differences became passionate and distressing. In May, 1791, by openly accepting and eulogizing Thomas Paine's " Rights of Man," a spirited reply to Burke's "Reflections on the Revolution in France," Jefferson placed himself at the head of the Republican party in the United States. The difference between the two chief members of the cabinet rapidly developed into a personal antipathy, and both of them ardently desired to withdraw. Both, however, could have borne these disagreeable dissensions, and we see in their later letters that the real cause of their longing to resign was the insufficiency of their salaries. Jefferson's estate, much diminished by the war, was of little profit to him in the absence of the master's eye. General Washington, who did equal justice to the merits of both these able men, used all his influence and tact to induce them to remain, and, yielding to the president's persuasions, both made an honest attempt at external agreement. But in truth their feelings, as well as their opinions, were naturally irreconcilable. Their attitude toward the French revolution proves this. Hamilton continually and openly expressed an undiscriminating abhorrence of it, while Jefferson deliberately wrote that if the movement "had desolated half the earth," the evil would have been less than the continuance of the ancient system. Writing to an old friend he went farther even than this: "Were there but an Adam and an Eve left in every country, and left free, it would be better than as it, now is." On every point of difficulty created by the French revolution the disagreement between the two secretaries was extreme. On other subjects there was little real concord, and it was a happy moment for both when, on 1 January, 1794, President Washington accepted Jefferson's resignation. He left office at a fortunate time for his reputation, since his correspondence with the English plenipotentiary, George Hammond, and the French plenipotentiary, Edmond Genet, had just been published in a large pamphlet. Jefferson's letters to those gentlemen were so moderate, so just, and so conciliatory as to extort the approval of his opponents. Chief-Justice Marshall, an extreme Federalist, remarks, in his "Life of Washington," that this correspondence lessened the hostility of Jefferson's opponents without diminishing the attachment of his friends. Five days after his release from office he set out for home, having been secretary of state three years and ten months. All his interest in the cultivation of the soil now returned to him, and he supposed his public life ended forever. In September, 1794, after the retirement of Hamilton from the cabinet, Washington invited Jefferson to resume the office of secretary of state; but he declined, declaring that "no circumstances would evermore tempt him to engage in anything public." Nevertheless, in 1796, Washington having refused to serve a third term in the presidency, he allowed his name to be used as that of a candidate for the succession. The contest was embittered by the unpopularity of the Jay treaty with Great Britain. 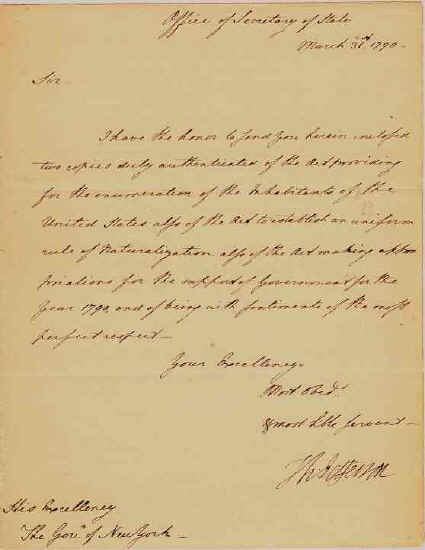 Jefferson had desired the rejection of the treaty, and he remained always of the opinion that by its rejection the government of the United States might at length have secured "a respect for our neutral rights" without a war. Jefferson had a narrow escape from being elected to the presidency in 1796. John Adams received seventy-one electoral votes, and Jefferson sixty-eight, a result that, as the law then stood, gave him the vice presidency. In view of the duties about to devolve upon him, he began to prepare, chiefly for his own guidance in the chair of the senate, his " Manual of Parliamentary Practice," a code that still substantially governs all our deliberative bodies. He deeply felt the importance of such rules, believing that when strictly enforced they Operated as a check on the majority, and gave "shelter and protection to the minority against the attempts of power." Jefferson much enjoyed the office of vice president, partly from the interest he took in the art of legislation and partly because his presidency of the Philosophical society brought him into agreeable relations with the most able minds of the country. He took no part whatever in the administration of the government, as Mr. Adams ceased to consult him on political measures almost immediately after his inauguration. The administration of Adams, so turbulent and eventful, inflamed party spirit to an extreme degree. The reactionary policy of Hamilton and his friends had full scope, as is shown by the passage of the alien and sedition laws, and by the warlike preparations against France. During the first three years Jefferson endeavored in various ways to influence the public mind, and thus to neutralize in some degree the active and aggressive spirit of Hamilton. He was clearly of opinion that the alien and sedition laws were not merely unconstitutional, but were so subversive of fundamental human rights as to justify a nullification of them. 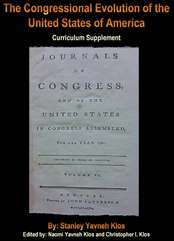 Start your search on Thomas Jefferson.